Meat Loaf Parmesan, Thyme for Cooking main course. Leftovers are wonderful, particularly when you can serve them in a totally different way. The chunky tomato sauce and freshly grated Parmesan take the humble meat loaf to a new gastronomic level. Be a bit careful serving so the slices stay together. Heat oil in medium nonstick skillet. Add chili powder and sauté 1 minute. Add onions and garlic and sauté 5 minutes. Roughly chop tomatoes. Add tomatoes, their reserved juices, herbs, vinegar and tomato paste to pan. Stir well, reduce heat, cover and simmer. Cut meat loaf into thick slices. After sauce has simmered for 10 minutes lay slices of meat loaf in the sauce. Cover and simmer another 10 minutes, until meat has heated through. 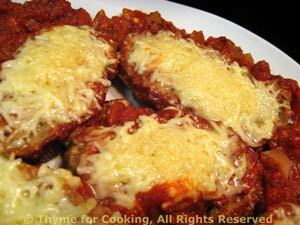 Sprinkle cheeses on each slice and cover until cheese has melted. Serve, sauce on the side.